Alberta Film Ratings lists 2:24 minute Hobbit 3 main trailer! Following up on our recent news that a Norwegian distributor let slip that the main trailer The Hobbit: The Battle of the Five Armies is coming next week, Alberta Film Ratings has just issued a listing. Rating is PG (no surprises there) and the running time is listed at 2 minutes and 24 seconds. So even if November 6 is not quite on the mark, next week is looking very much a goer. 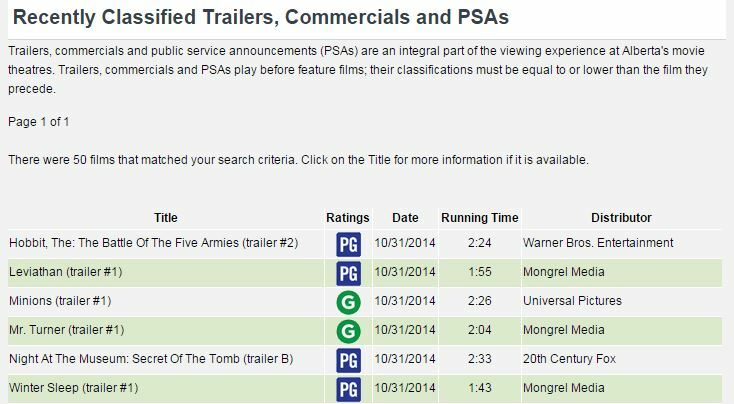 In fact, we might all have something to watch as early as Monday (Nov 3) or Tues (Nov 4). Fingers crossed. We also hear via the grapevine that “someone familiar” may pop up (I’m thinking/hoping Chris Lee!) and that Gandalf’s phrase “Now is the time where all must choose what side they are on…” could feature again. Rumours though, so here’s your grain of salt! Bootnote: Some good news on the premiere front involving the Kiwi actors. They’ll be attending the very last premiere in Los Angeles where a special celebration will be held.